When Ghost Town Games and Team17 combined in 2016 to bring us the original Overcooked, we were left wondering what on earth they were up to. At the time there were concerns that this was just a ‘Cooking Mama for proper consoles’, but it instead turned up to wow the crowds, especially those who liked to delve into the dark arts of local cooperative play. In fact, it is no exaggeration to say that it went down an absolute storm. 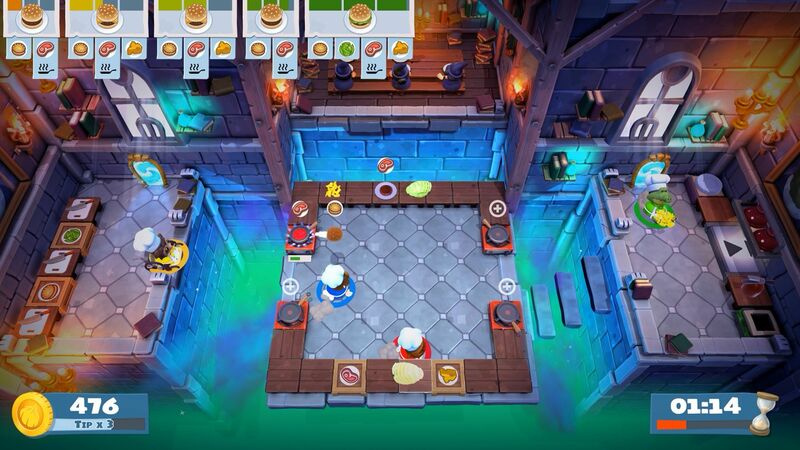 Now though the same teams are back, this time with Overcooked 2, promising the same brilliant gameplay, just with a whole host of newly added features including online play. So do Team17 and Ghost Town Games deserve the coveted Michelin 3 Star award for services to food in gaming? By golly yes, for with near on everything that was great in the original game, Overcooked 2 has built on it to raise the cooking stakes once more. Again we see the Onion Kingdom under threat, and that means we get the opportunity to don our aprons and jump out of the frying pan and into the fire, as we cook up some tasty treats in order to prove our worth to the kitchen gods and stave off the hunger of The Unbread, an evil force that is looking to take over the land. As far as storytelling goes, Overcooked 2 doesn’t quite hit the heights found in the original, but it is still well delivered, with the Onion King, his ever trusty dog Kevin, and a range of utterly weird chefs all represented in honourable fashion. It is however from the cut scenes of this story in which we get thrown out into the wide world of the Onion Kingdom, traversing the interactive map screen via bus, hitting switches, opening up various new areas, and taking on new cooking challenges. If I’m honest though, for as glorious as this map navigation system is, and as well as it immerses you into the kingdom, I could quite easily go without. See, it’s not just a case of driving your bus from stage to stage to find cooking jobs to partake in, and having to hit switches in order to lift ramps which in turn give access to new levels, all seems a bit of a faff… especially when you are in the need of heading back into earlier levels to try and better yourself, your cooking, and your scores. I can’t however let the finicky map selection screen prove too much of a downer though, because the second you step foot off the bus and into the wonderful kitchens that Ghost Town Games have created, all hell breaks loose and a ton of fun smacks you right in the chops. For those not yet acquainted with how Overcooked works, then this cooking sim tasks you with taking a ton of ingredients, chopping them up and then cooking them to the best of your ability, before preparing them on a plate and serving them up to hungry diners. The quicker you go about this, the bigger your tips and the more cash you will earn, steadily returning the Onion Kingdom to its former glory and removing it of The Unbread. On paper, that is a seriously simplistic idea. In reality though, chaos ensues. Whether you are playing alone or with friends via the local or online capabilities, Overcooked 2 is an utter nightmare for those looking for peace and quiet. Just like that of a real world kitchen, communication and teamwork is key, with orders being shouted, plates being dropped and overcooked burgers being fried – so much so that the use of a fire extinguisher in order to put some flames out because you’ve been preoccupied elsewhere is fairly commonplace. In fact, within mere seconds of the action kicking off, screams will be heard, panic will be felt and any form of sense or sensibility will go right out the window – all in the name of fun. Overcooked 2 is just as frantic as previous, and much of that is down to the unique way in which each kitchen handles. Grabbing some meat, chopping it up and frying it before placing it in a bun isn’t difficult, and creating burritos and pizzas is a doddle, but when the chopping board is the other end of a travelator, or the frying pan is on the other side of a small river, things go awry. With a number of new kitchens in place for the sequel, it’s great to be able to try and overcome the odds as teleporters and portals see you magically appear elsewhere, whilst the bubbling pots of a new wizard school kitchen will have you chasing down moving items and the raging river rapids happily see your best creations whisked away in the torrents. 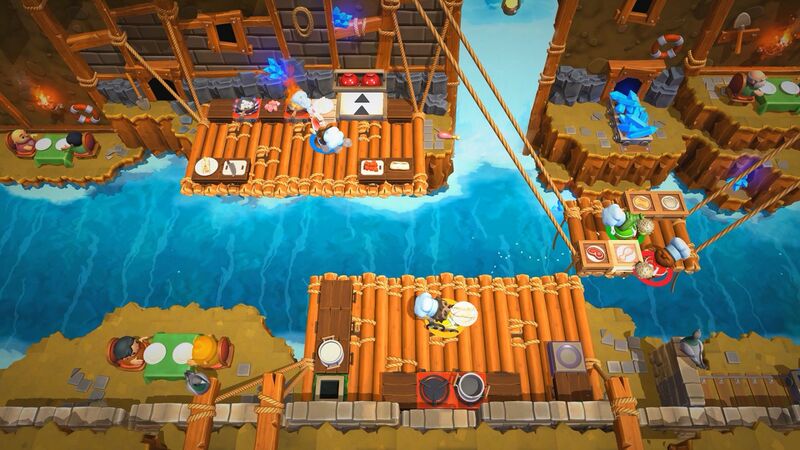 It is here where teamwork is vital, and managing this is quite possibly the trickiest, but most rewarding, of all the elements found in Overcooked 2. Playing alone, a simple press of the bumper buttons will see you being given the chance to play god with a couple of cooks as and when is required, but it is with the cooperative multiplayer side of things where this all really shines, with failure to meet set targets or earn enough cash nearly always accompanied by talk of ‘we can do this’ and ‘just one more go’. And for the most part you can, because whilst each stage in itself is a tricky proposition, practice really does make perfect in the Overcooked kitchen and sitting back, delegating roles and ensuring that each member of the team is on their game will see you able to send out the orders as they come in, and reasonable success to be made of it too. Much like the first game though, should one member of the team not quite be at it, the whole damn thing goes up faster than a kitchen on fire. The multiplayer is an absolute blast – quite possibly more than any other multiplayer focused title on the market – and with the new throwing mechanic ensuring you can, should your aim be right, ping food across the kitchen, opportunity is there for your workforce to be the best anyone has ever seen. 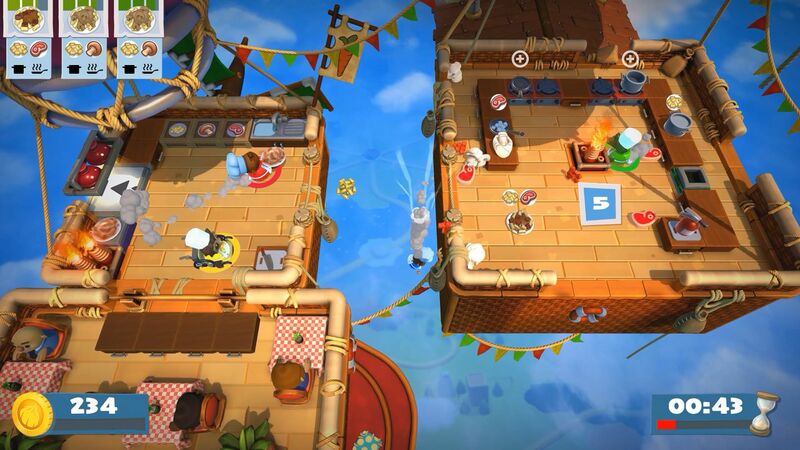 With a multitude of recipes to create, tons of ingredients to utilise and even more wacky chefs in place than before – seriously, you’ll adore the raccoon, eagle and panda characters – Overcooked 2 really has done that rare thing and been able to build on the super solid foundations that were already in place. For all this to really work though, the actual mechanics and controls need to be up to speed. This is one seriously fast-paced game and it only takes one small slip for everything to go a bit wrong – thankfully the control scheme is simple and the movement works well. Yes, there will be times when you are left cursing the fact that you’ve just binned a plate destined for the pass, or when you fall off a bridge into the abyss and are robbed of precious seconds of time, but on the whole it works wonders. It looks great too, with bright and beautiful cartoon visuals allowing for the fun edge of Overcooked to be thrust home at every opportunity. Granted, it may become a bit too hectic to really understand what is what at times, especially when you find multiple ingredient types flung across the room, but that should only push you and your squad to aim higher, keep the kitchen cleaner, and ensure that the communication aspect is never forgotten. Those visuals are complemented well by some rather decent audio too, and even though it’s a shame to see the story told via text speak, the soundtrack and every single kitchen sound comes across delightfully. Odd bugs aside – with one that affects the game when a second player switches their controller off being the most prominent – Overcooked 2 is simply brilliant. 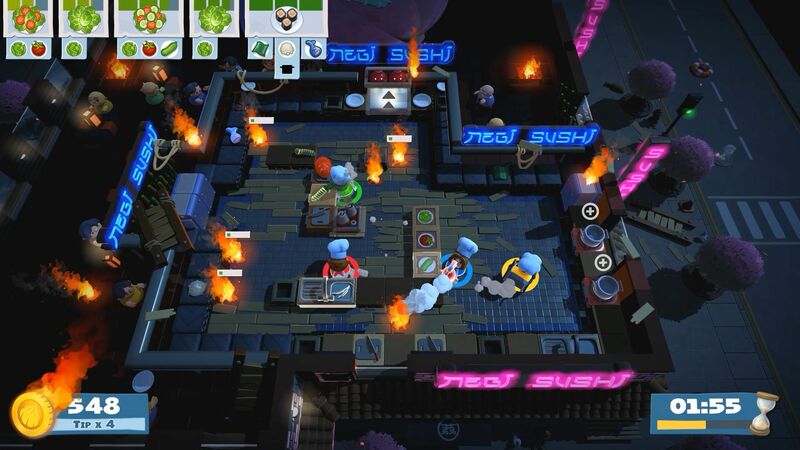 It comes with a massive story mode that is full of various recipe types to keep you busy, an arcade option for those wanting to hone their skills, and a versus mode which sees the very best chefs pitting themselves up against one another in a cook off to the death. All that combined means that it is a must purchase game… especially for those looking for some multiplayer madness.